Happy, happy Friday!! I'm excited for today's post because I've got some discounts for my readers! 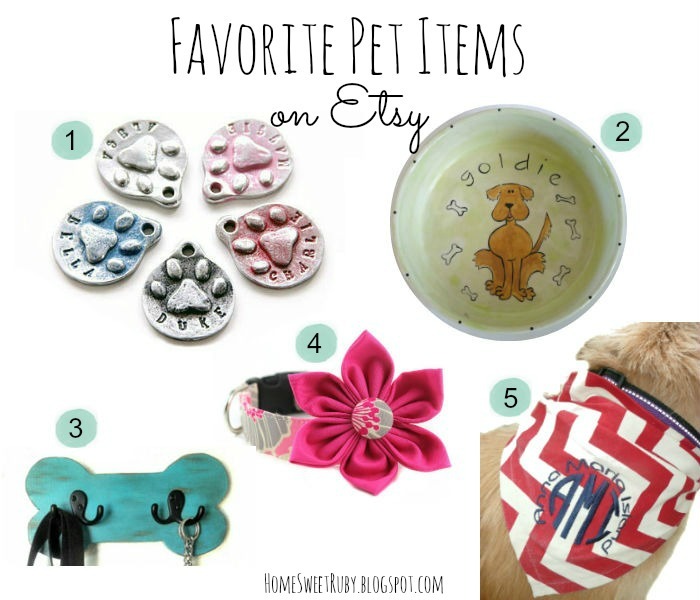 :) I'm linking up again with Darci, April, Natasha, and Christina to share my favorite pet items from some fabulous Etsy shops! When I check out the blogs on this link-up and others written by many of my (awesome) followers, it seems like almost everyone has a dog, probably just as spoiled as mine. So this week as I came across some of Ruby's bandanas, it got me thinking about all of the cute items sellers post on Etsy. Here are some of my favorites that would be great as gifts for pet lovers or if your pup just needs a new accessory! 2. Personalized Ceramic Dog Bowl by Suzaluna. How adorable is this dog bowl? They come in small and large sizes. The shop owner, Suzanne, went to art school and is a fellow dog owner. She encourages customers to send her a photo of their pets so she can make sure the drawing looks like your fur baby. Your dog may not notice how cute this is, but I love having something like this since Ruby's bowls are in the kitchen where everyone can see them. The bowls are dishwasher safe although hand washing is best. As an added bonus, Suzanne also generously offered a 20% off discount for you! 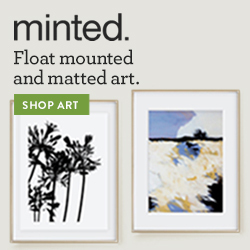 At check out, use the coupon code LUNA20. Woo! 3. Dog Leash Holder by HappyTrailsThrift. I love all of the different colors this comes in and it already has the parts on the back to hang it on your wall. I don't know about you guys, but Ruby's leash and harness end up all over the house because we don't have a dedicated spot for them so we could use something like this! 4. Dog Collar Flower Set by BowWowCouture. I love the little flower on this dog collar! There are tons of designs and even bow ties for the boys. I purchased just the flower for Ruby a long time ago and I can velcro it on any of her collars. Everyone who sees it on her comments how cute it is and Ruby doesn't really notice it. 5. Monogramed Dog Bandana by Baileywicks. Because what dog wouldn't want a monogrammed bandana? haha! 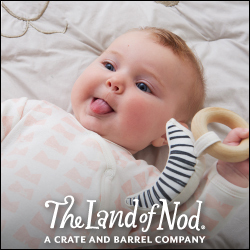 Okay, okay, I'm the one that likes monograms but you have to admit this is too.cute. You can choose from 5 different chevron colors and get any monogram embroidered onto the bandana. I know I am going over the five favorites, but I can't help it. I have to tell you about my friend Maggie who painted us this pet portrait from a picture of our little Ruby as a wedding shower gift. How amazing is that?! (And no, she didn't know I was going to wear the exact color red as the background of the portrait... haha!) Maggie creates "energetic art" that is inspired by traditional southern folk arts and craft, combined with mixed media collage. 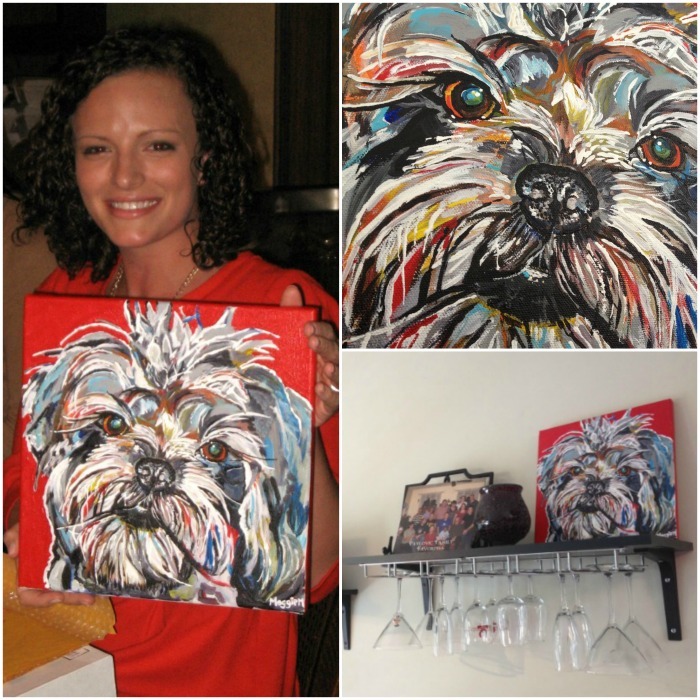 She does pet portraits in her spare time and you can see more of her amazing work here. Not only is Maggie a talented artist, but she is an amazing friend and person, so I really encourage you guys to check her website out! What do you think, anyone love these items as much as me?! I hope some of you can take advantage of the discounts, Aaron and Suzanne are so great for offering them! Let me know if you purchase any, I can do a roundup of photos from readers after you receive the items! Also on a totally random note, I picked up this J. Crew Factory Quilted Puffer Herringbone Vest that I had my eye on last year before it sold out. Excited!! Now, I'm off to decorate this house for the hubby's birthday... I hope you all have a great weekend!! what a cute portrait, your friend is so talented! also, i love those custom pet id tags too... if only i had a puppy of my own to buy one for :( happy friday, i hope your hubby has a great birthday! Thanks Beth! Maggie really is a great artist, I wish I had her skills! Love the monogrammed puppy bandana, love the painting, and love the vest! Me too! Than again I love anything with monograms, haha! The vest already sold out online too, hopefully I like it just as much when its delivered! So cute, I love anything monogrammed, that bandana is too adorable. And, oh my goodness why did you have to post that vest, it is so cute...I might have to treat myself, grrrrrrr. Have fun with celebrating your hubster's bday! Thanks Brett, same here! Hope you got the vest before it sold out! The pet portrait is brilliant! I love the custom pet ID tags. Gidget's is so worn down that it's hardly legible anymore! Plus, these are so much cuter than the standard ones, anyway :) Hope your husband has a great birthday! Yay! I'm glad you like them too! Hope you were able to get one or a few! I love the bowl with your dog's name and picture on it! And I love the collar with the flower on it but my husband would NEVER go for it! I'm definitely going to check out your friends website. I would love to have a painting of my dog Pixie! Yep..now Bella needs a monogrammed dog bandanna for sure! I love that you did a pet addition! I am a little obsessed with my dogs! Hope you have a great weekend! I love #2 & #5. Great five on Friday friend!! !